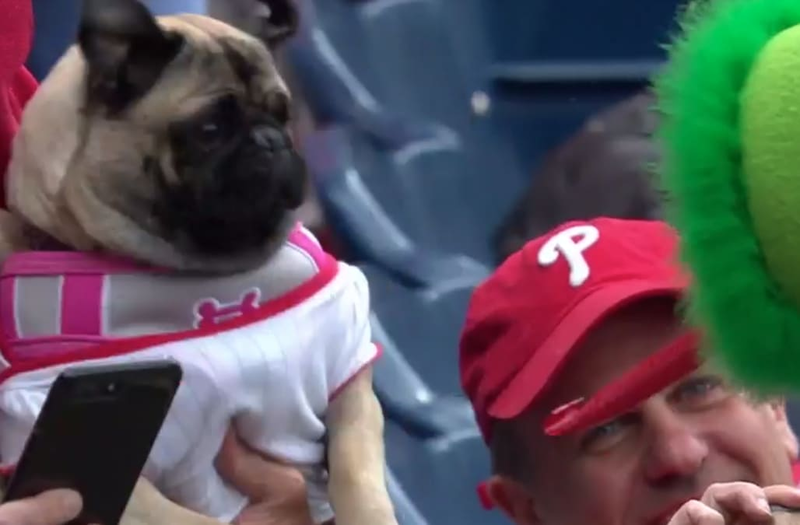 And because the Phanatic loves all creatures, there were dogs in the stands, too. The Phanatic went up to one, an adorable pug, and attempted to shower it with love. And the pug was into it … for awhile. It decided to take a look into the Phanatic’s snout and see what was going on in there, and that little doggie wasn’t prepared for what happened next. The picture doesn’t really do it justice, though, so here’s one of the most important gifs you’ll see all week. Nope, that pug was NOT ready for the Phanatic’s long, red tongue to unfurl. Of all the things the pug expected to happen at that moment, a skinny tongue emerging from the Phanatic’s horned snout definitely wasn’t one of them. The ears went back, the eyes got wide, and the pug’s wrinkly face had a “WHAT IS THAT WHAT IS HAPPENING” look on it. The best part is that the pug tried to look into the Phanatic’s snout one more time before being scared off for good. No one knows what lies within the Phanatic’s snout, little pug. It’s best to not even try to discover it. Football - Oldham Athletic v Blackburn Rovers - Pre Season Friendly - SportsDirect.com Park - 25/7/15 A bees nest is removed from the goal posts before the game Mandatory Credit: Action Images / Ed Sykes Livepic EDITORIAL USE ONLY.